This is my family: Vanished without a trace. . . This is what I know: Pain has a flavor. . . This is what I fear: The worst is yet to come. . . This is the truth: Love, safety, family. . . it’s all touch and go. "Gardner generates. . . irresistible momentum." "The suspense builds as the action races to a spectacular conclusion and the unmasking of the plot's mastermind." "Gardner pulls readers right into Libby's personal and family drama as she bears witness to the horrific captivity her family undergoes. . . Gardner's previous thriller, Catch Me, debuted at number two on the New York Times best-seller list; this one is likely to follow suit." 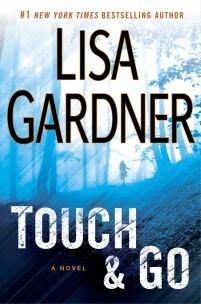 "Lisa Gardner, the master of the psychological thriller, has delivered another tour de force with Touch & Go, which exposes the raw nerves of a family imploding, and an investigator trying to escape her past. A character says in the beginning of the novel, 'Pain has a flavor. The question is, what does it taste like to you?' Touch & Go is the opposite of pain; it's a total pleasure." ". . .Gardner is considered to be one of the best in the business, and for good reason. She delivers twist after twist, pulling off complexities with apparent ease, all culminating in a breathtaking finale that is both satisfying and surprising. Ultimately, it’s readers who are taken captive – and Gardner who is holding the reins, every step of the way. . ."
"The suspense crackles as the Denbes grapple with their captors' bewildering brutality. But what gives the story heart is Libby's dawning realization that her family may have been broken long before their kidnappers appeared." "Whip-crack taut, the book still finds time to reveal a great deal about human character: Gardner is very subtle." "Gardner keeps the suspense high." "The author brings to life all of the fears, insecurities and vulnerabilities that are part of the human condition by creating characters that are so very real that you can see them in your mind’s eye. Readers feel what is inside the story’s protagonist as she runs through a gauntlet of shifting emotions. Gardner combines this human drama with knife’s-edge suspense, as all along the way you keep hoping against hope that the cops will figure it all out before it’s too late. So if you love a nail-biting thriller that will keep you turning the pages until the very end, you’ll love Touch & Go as much as I did." ". . . Lisa Gardner's pitch-perfect journey into affluent suburbia's dark underbelly. . . No one writes this kind of modern horror tale better than Gardner, no one."